When I saw this recent photo of my brother in law, I instantly knew that it deserved a spot on my blog. But, in what context? You may recall my Father’s Day post Confident Like a Man where I talked about a gender difference that I apparently don’t possess. But are there gender differences around food? It just so happens that I am hosting a baby shower at my home tomorrow afternoon. The invitations went to a wonderful list of friends and family of the mother-to-be and I’m scurrying about working on centerpieces, cupcakes and the menu. As it turns out, the attendees are all female and my menu? Quiche and salad and white wine and lemonade. But what if this was a co-ed event or better yet an all-male entourage? What would I be serving and would it be different? The answer is yes. We all know that Real Men Don’t Eat Quiche. Certainly I’d be firing up the grill and while turkey legs find themselves outside of my repertoire, I’d likely be doing heavier dishes and meat. Scouring the internet, I learn that gender differences around food are real and that they are exacerbated by culture. Brian Wansink, director of Cornell University’s Food and Brand Lab, says that people are more likely to eat foods that they associate with qualities they’d like to see in themselves. So men who want to be strong and masculine are more likely to eat strong and masculine food such as meat. Women, on the other hand, will go for lighter fare such as salad and fruit and have an endless craving for chocolate – especially once each month – a gender difference but also a hormonal difference. Oddly, the chocolate divide disappears in Egypt where men and women crave it in equal proportions. And a researcher in Great Britain found that among school age children, it was actually the boys who had a greater propensity for sweets. So what of this gender divide? I’m unwilling to say that it’s an outflow from early cave days where men hunted and women gathered. No, I’m much more likely to take the reasonable approach and enjoy a light lunch even if it means that I’m looking for these qualities of femininity and sensibility in myself. Preheat over to 375 degrees. Melt the butter in a small saute pan. Add onions and cook over medium heat until they soften. Add the mushrooms, salt, pepper, thyme and mustard. Beat the eggs well, adding the flour and the milk gradually. Spread the grated cheese on the bottom of the unbaked crust. Add the onion-mushroom mixture and then top with sliced tomatoes. Pour in the egg mixture and add a few dashes of hot sauce. Bake for 35 to 45 minutes or until center is set. Share with female friends and men willing to show their softer side. That is a fabulous picture. Have fun at the baby shower. Today? For lunch, I’m going to make a butternut squash soup, it goes well with my stinking cold. I’m sorry about your cold. Butternut squash is in season and sounds perfect. Ah, a good time was had by all. 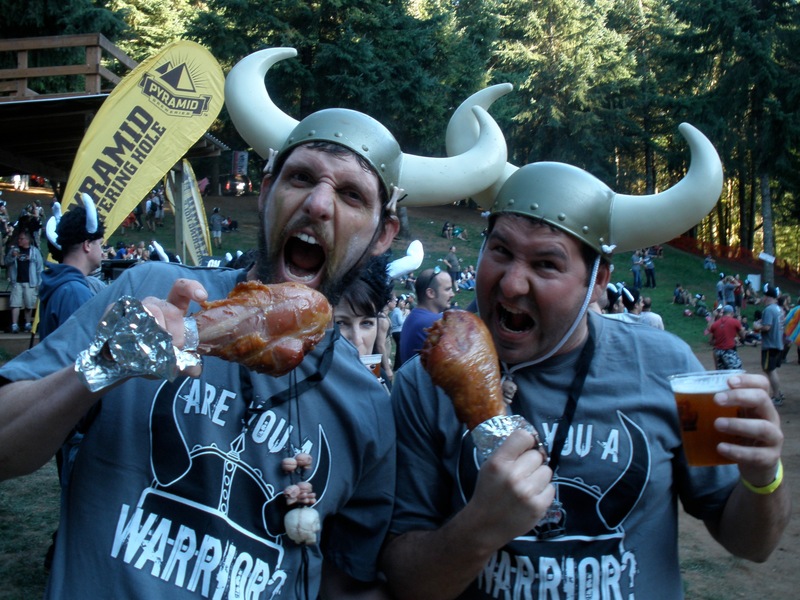 We’ll miss you next weekend as we warriors return to conquer turkey legs and beer. Arrrgh. I love you, sis. And hopefully you’ll have more good photos. Think of me here with crumpets, tea, and oh yeah – chocolate. Good luck to you. Please share your find. Fascinating! Genetically, men crave protein due to their larger muscle mass. As for sweets…I’ve known men with greater sweet tooths than I as well as men who’d rather something salty! Lunch today consisted of cheese burgers with the works! We had a rather nice Fall day and it was a treat to fire up the grill and sit outside for lunch knowing these days will be few and far between in the coming months! I did read an argument about the bigger muscle mass. Glad you’re enjoying your weather. Our shower was outdoors and lovely. I definitely agree there are gender differences when it comes to food! But nevertheless I also know men who eat vegetarian or have a weakness for chocolate, and women who are real meat eaters. Yes, I have seen both too! Oh no! That actually sounds good to me. Tammy, I love and look forward to all your blogs but this one amused me because….you touched on some fonder spots. My brother and sister Val came and helped tile the hearth today, gathered firewood and wild mushrooms and lunched on “turkey vegetable soup and shrimp salad. Pear pie with ginger icecream, on a rainy day. Nick munched truffles inbetween . You are absolutely on target with gender differences but we enjoy combining the food factors and sharing the joy. I know the shower was beautiful, fun and yummy. Thanks for all your words of wisdom coming our way. I walk and talk it and love it!!!!! Pear pie with ginger ice cream sounds wonderful! Very interesting, and a wonderful photograph. Your quiche recipe is great. The quiches turned out well. I did four all together; one tomato basil, one arugula and sweet pepper, one arugula on it’s own and one with mushrooms like the recipe. We did a good job of eating but I can always whip something up. I think it’s a combination of both. One article that I read said that the “excessive meat and ale” tastes are typically held by men in countries where they’ve not experienced starvation. That’s a unique perspective. Yes! That is likely because you are a fabulous cook. Those are definitely some manly men. I love the photo! I definitely think there are differences in food preferences for men and women – at least around my house there are. After a while, it makes it hard to cook! Thanks Kathy. There are differences in my house too and it does make it difficult after a while. I love the thoughts on the gender differences and suspect culture plays strongly here as well, as evidenced by your Egyptian and chocolate example. My hubby is definitely much more vegetarian than me (he grew up in CA) and I grew up in MN where if you did not have a protein and a starch on your plate something was wrong. I grew up in a house like that too and my hubby likes chocolate more than me. I like the theory about food being aspirational, that at some level we really do think we are what we eat, and I think it’s great that you quoted a Cornell professor saying it. You always do your homework, Tammy, and that’s one reason your blog is always such as pleasure to read! Thank you Todd. I was hoping that you and some of my male readers would be by to validate! I totally agree with that study; I can tell usually if a blogger is male or female by the recipes they post. As for myself, I fit the stereotype and could eat chocolate endlessly and nothing else! I like it too but I am interested in the cultural aspects. If I can ever get my hands on the actual study I would be interested to see what the actual implications are. After 25 years of mostly vegetarian eating, I switched back to meat in 2001. I’ve noticed a distinct calming effect when I eat beef; in fact, when I have a particularly stressful day or haven’t slept well the night before, I find eating beef is quite grounding. That said, there’s a distinct peer and cultural pressure around women’s eating habits. No wonder some of us gorge at home alone when no one’s watching…. Great point on the bingeing Diane. I bet you’re right about that. I absolutely agree that there are such things like men menu and women, menu…. Men really love meat, aren’t they? I think that could be part of it but I also think it’s a complicated issue. As Diane points out, there are social pressures. Some of it is cultural too. When cooking for a mixed crowd of men and women, I definitely plan on dishes that are different than if I were only cooking for women. After some thought, I’m not sure if it’s a cultural thing, or if it is just that I know what the men in our particular circle prefer. Like you, I would be interested in reading more about the study. As for lunch, I had a wonderful spiced pumpkin soup with a healthy dollop of sour cream stirred in at the end. Perfect for our fall weather which has finally made it to Phoenix! Yes, I have a pumpkin sitting here that needs to find it’s way into the oven tonight. First off, that picture is hysterical!!! I do agree that men typically more the meat and potato eaters. I do think women will eat lighter foods (salads, etc) due to the taste factor but largely due to women constantly monitoring their weight. I agree Kristen. I buy into the weight argument. I don’t really believe in gender differences myself. I believe there are differences, as in so called “male traits” or “female traits” but I think those traits, (and tastes in food) and can be found in bio men or women. ok, bio men or bi-men? I don’t think there is any rule and agree that all traits can be found in both sexes – just not universally. I love the Moosewood cookbooks — the newer books are less fatty but all are good. I loved the photo and thought that photo alone would make a great Weekend Cooking post. I was chuckling so much, my husband had to come by and see what was so funny. That’s the way I felt about the photo too Beth. It captured so much without a single word. I DID get that impression from your last post! A grand & lovely picture,..ahahahahahaha!! My husband & I differ a lot in food tastes. He is a true meat person & I am not so. But we eat vegetarian 3x/week & he loves it! Sometimes I can say the say but tonight my husband is not pleased with the okra curry. He wants wings! Interesting thoughts on the food divide among genders. I love quiche and the only time I’ve seen my hubby eat it is when I don’t serve anything else. Lunch: I love my salads, with a little rice and protein of some sort (fish or veggie burger). Nothing varies much when it comes to lunch. I have taken to scrounging around the office! Today, nuts, mashed potatoes and sauteed veggies. Not bad. Ha, ha, love the photo! I have to agree with Hannah that food is social, cultural and acquired. Yep and there’s research to support it. the men lined right up and dug in! Aha! Good field investigative research! I love it and I did not know you used to have a cafe. That is a nice photo—but if we eat food with characteristics we’d like to associate with ourselves, why am I always reaching for the nuts? Ha! ha! I guess I can’t comment on that. I have a hard time believing in food-gender differences, since my wife is a huge meat and potatoes woman, and I love a good quiche and have a big problem with craving chocolate and sweets and cakes. The bottom line is we both love food, of all types. Including quiche. But it’s an interesting idea… You could also look at advertisers to see how they handle the marketing of food, if certain foods are advertised with a more feminine (yogurt) or masculine (beer) approach. Then again, I like yogurt and don’t touch beer. I don’t think these things are universally applicable but I think they are interesting to think about and the point you raise about marketing is a good one. Nancy at Goodfoodmatters seems to have some experience from her cafe-ownership years when she changed the names of various entrees and found that it had an effect on who ordered them. I thought about mentioning the gender differences of drinks a bit more as I did find some interesting stuff about it. I think that Bradley summed it up in his comments about marketing and then Nancy was able to test some stuff out in her cafe. All fascinating stuff and really fascinating for me since I was trying to find something to write about to support a photo. It’s a good exercise. Your salad sounds good to me. I haven’t had mackerels in a very long time. Seems like the crazy kind just based solely on the photograph. certainly the photo is an extreme representation but apparently there is some research to support the concept. And with anything, there are thankful exceptions.